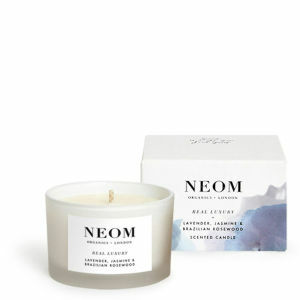 Containing natural vegetable wax and 100% natural fragrance, the NEOM Organics Happiness Scented Candle boasts a refreshing, balancing aroma designed to uplift your mood and fill the air with natural goodness. With a burn time of 35 hours, it's formulated with extracts of white neroli, mimosa and lemon with hints of grass for a light, awakening scent. Free from toxins, the Happiness candle is made only from the purest ingredients. K.D. I love the scent of this candle. It is mainly white neroli, mimosa and lemon, with a hint of grass. It is not too sweet in my opinion. It fills a room with its lovely aroma.